Bruce Springsteen is an American singer-songwriter, known for his work with the E Street Band. 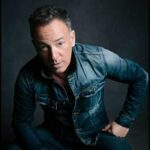 Nicknamed “The Boss”, he is widely known for his brand of poetic lyrics, Americana, working class, sometimes political sentiments centered on his native New Jersey, his distinctive voice, and his lengthy and energetic stage performances—with concerts from the 1970’s to the present decade running at up to four hours in length. His artistic endeavors reflect both his personal growth and the zeitgeist of the times. "I do a lot of curiosity buying; I buy it if I like the album cover, I buy it if I like the name of the band, anything that sparks my imagination." "I always wanted my music to influence the life you were living emotionally – with your family, your lover, your wife, and, at a certain point, with your children." "Some of the greatest blues music is some of the darkest music you’ve ever heard." "My image had always been very heterosexual, very straight. So it was a nice experience for me, a chance to clarify my own feelings about gay and lesbian civil rights."